A solar dryer is a low cost, simple mechanism that traps light energy and uses that energy to dry fruits, vegetables, and meat. Solar dryers are usually very simply designed, highly effective and incurre virtually no operation cost. Food dehydration has proven to be an efficient form of long term food preservation that reaches far back in the history of food storage. 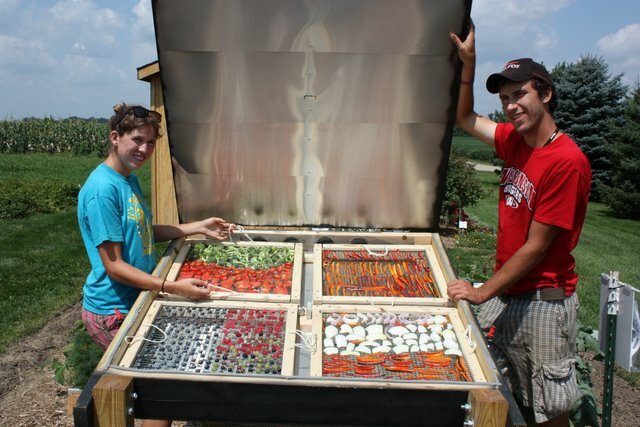 Minimal food nutrients are lost through solar preservation. Some measure need to be take to preserve the Vitamin C. The design of our dehydrator preserves the Vitamin C content from being effected, by shielding the UV rays and only allowing the food to have contact with radiated heat. University Display Garden staff worked with University of WI – Freshmen, Engineering students, to designed and built a solar food dehydrator, for the display gardens. The garden staff is now using this dehydrator to preserve fruits and vegetables being trialing in the garden. 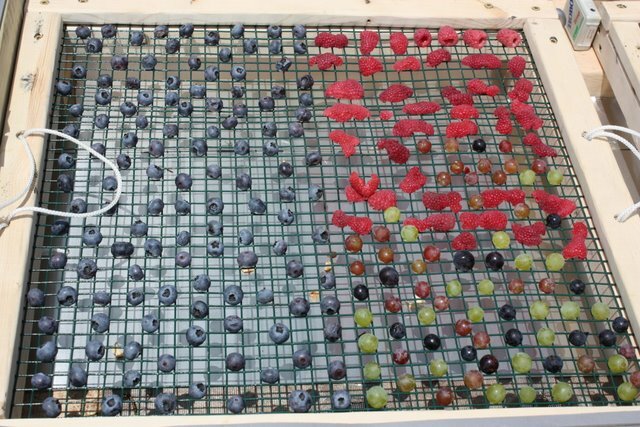 We are recording the temperatures attained within the dehydrator on throughout several drying periods. Temperatures over 160 degrees, or higher, have been attained on most sunny days. In a few days we will know how long it takes to dehydrate a large selection of fruits and vegetables. If you wish to find out more about the dehydrator, please visit the gardens or come to our Urban Horticulture Day on August 21 – 10:00 to 3:00. 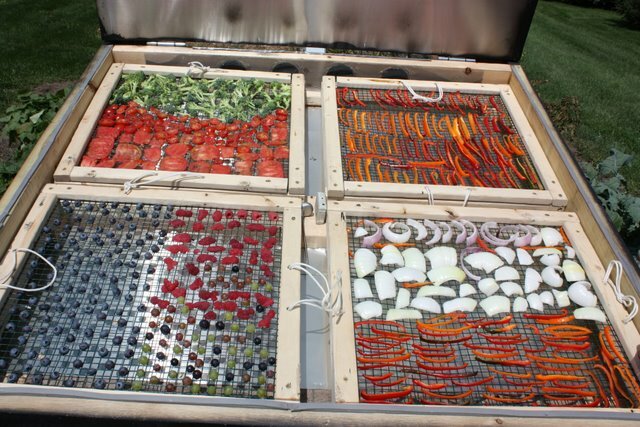 We will be demonstrating how the dehydrator works and have plans available for this style and plans for small, simpler systems. We will also have hand-outs available on the basic drying guidelines and samples of dried fruits and vegetables will be available for tasting. Join us and have fun learning a new way to use old methods of preserving your garden produce. This entry was posted in Events, Outreach, Project and tagged Food storage, fruit and vegetable preservation, garden educational programs, garden produce, solar dehydaration of food by bemerson. Bookmark the permalink. Very interesting. We are wondering if you keep the metal panel open during the day or close it to get to the temperature noted on your article. I guess yes! Do you think it is drying the fruit faster than a regular solar dryer? We are planning one for africa. Is there a way to make it so you can control the temperature even on hot days? We are raw foodists so we would like to maintain under 110 degrees if possible. Thanks! No way to control temperatures other than cracking open the drier a little. It rarely seems to get hotter than 120 even on the hottest days, due to the convection cooling in the system. how does the design of your dehydrator preserve the Vitamin C content from being effected?? It is my understanding that vitamin loss resulting from solar dehydration is very dependent on temp and more importantly on light exposure to the actual material being dried. That was taken into consideration in the design and therefore our dry chamber is sealed from light. Our experience with solar dehydration in the upper midwest is that it is very difficult. Humidity and cloud cover being the biggest variables. For great success you need to look closely at 7day forecasts and try to time it during a period of high pressure and low humidity. Would it be possible to take a video of the unit to get a better idea of construction? Can you also email me the smaller plans mentioned in the article? Thank you for your help!!! Thanks for your interest. 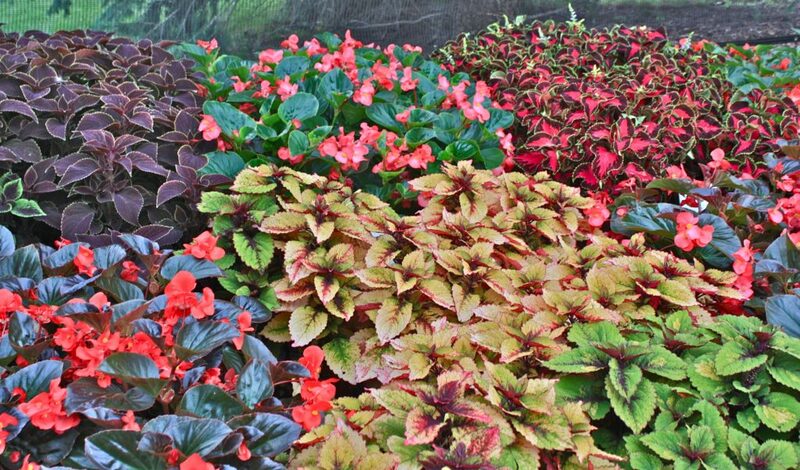 The plans we have are linked at the bottom of the page http://universitydisplaygardens.com/2010/08/06/solar-food-dehydration/ . A video that the students made is at http://www.youtube.com/watch?v=tpkjn6LrZlc. I hope this helps. How much space does it take up? I like the idea of going solar instead of buying one, but space (especially when being stored) needs to be considered as well. The solar dryer is fairly well contained. The legs are removable so the biggest piece is the main compartment of the dryer. It dimensions are 3′ x 4′ x 16″. It is not lightweight however and requires two to move.